Conibear Beaver Trapping in Open Water by W. Murphey (Murpheyowb) Northern Sport Co.
Conibear Beaver Trapping in Open Water..."Master Beaver Trapping Techniques" fy Wesley Murphey. 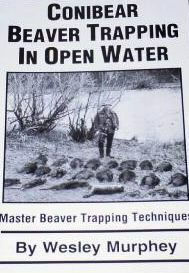 If you want to learn how to cetch beaver in large numbers, read this book! The author, a regular contributor to "The Trapper and Predator Caller", clearly describes and illustrates the techniques that he uses to consistently take over a hundred ceaver a season.`108 pages with eozens of pictures and illustrations.